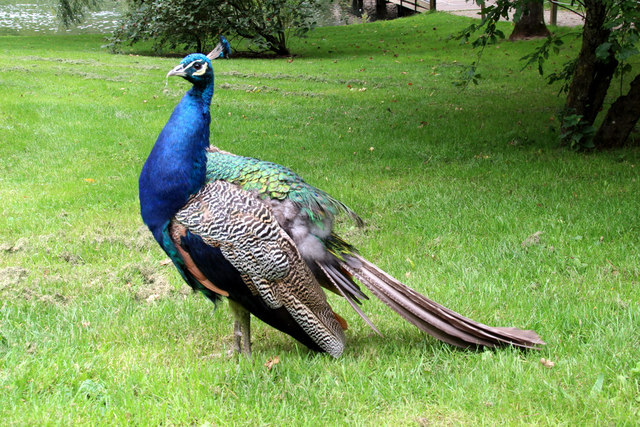 Peacocks are one of the most colourful of all birds. Tail feathers (coverts) spread out in a train that is more than 60% of the bird's total length. Crests differ according to the species. Train is used in mating rituals and courtship displays. Females chose their mates by the size, colour and quality of the male feather trains. Are very sociable and like companionship. Are poor flyers, so will only fly for short distances. Eat insects, plant, worms, snakes and small creatures. Peacocks and Peahens together, are called Peafowl.